If you’ve never played at an online casino before or simply aren’t that Internet savvy, this article is an easy step by step guide to help you join the world of online gambling. Whether you know your way around a computer or not, follow these steps and you’ll have the hang of it in no time. The first and most important thing is to find a reputable, trustworthy casino that is worthy of your time and money. There are lots of casinos in operation but there’s also plenty of rogue traders out to weasel unsuspecting players out of their hard earned money. To make it easy for you to identify a reputable casino, we’ve compiled a list of some of the best in the business. Follow any of the links in our table above and you can rest assured you’re playing at a safe and legitimate venue. Our favourite real money sites listed in the casino table tick all the right boxes when it comes to security, payment methods, game variety and exciting promo offers. So, how can you tell for yourself if a casino is legitimate and worthy of your time? First, have a look at the game selection and ensure there’s enough variety to your liking and that the type of game you’re looking for is available. If so, check the ‘about’ section to ensure that the site is licensed by a reputable gambling jurisdiction like Malta, Isle of Man, Alderney, Curacao, Antigua and Barbuda or Gibraltar. It should also carry the eCOGRA seal of approval, a body setup to safeguard us. Any section of the casino that requires you to enter your personal details must be adequately protected with a minimum of 128 bit digital SSL security encryption, which you can identify by looking at the website URL and checking that a padlock icon appears. Online casinos offer much more game variety than you’ll find in a land based casino including pokies, blackjack, roulette, baccarat, craps, poker, video poker, keno, bingo, virtual scratchies and other mini-games. One of the great things about online gambling is that casino vendors give you the option of playing games for free in demo mode without having to commit to any real money wagers. This is a fantastic way to explore a casino’s game catalogue and try new games without any risk to your pocket. We recommend that newbies take advantage of this free-play method in order to fully understand how online gaming works and to see if virtual play is right for you. Okay, so now you’ve found a safe casino that you like and have had a play around on some of the games it’s time for the really fun part – playing for real money. 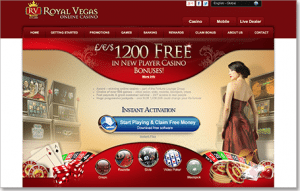 To win cash at an online casino you must first register for an account and deposit some funds to play with. To become a member at an online casino, simply click any of the ‘join now’ banners or links that are clearly displayed on the casino’s homepage. You’ll be required to enter some basic personal information like your name, date of birth, email address and phone number. This will only take a couple of minutes and once you’ve completed all your details you’ll receive a username and login straight away. Select the payment method you wish to use, enter your details as prompted along with the amount of funds in AUD you wish to transfer. Once you’ve clicked to transfer your money, the funds will usually be available to play with straight away. If you have any questions about a casino’s payment processing time or the available deposit options you can check the sites FAQ section or speak to a customer service operator using the live chat option or contact form found in the help section of the casino. One thing you’ll notice when visiting an online casino for the first time is that there’s usually some kind of welcome promotion up for grabs for new players. Welcome packages include offers like matched deposit bonuses and free spins and can be an excellent way to boost your bankroll from the get-go, giving you more money to explore games with. When registering for a new account with a casino always check the welcome bonuses that are available in order to take full advantage of any bonus offers. Now that you have an account funded with real money, you’re all ready to roll! It’s time to explore the game categories and play whichever games your heart desires. Online casinos offer much more leniency when it comes to wagering restrictions, so if you’re on a budget or just like playing on a more recreational scale there are plenty of games with low minimum bets, while high rollers can enjoy some outlandish maximum bets. All wins and losses are automatically added or deducted from your casino account and you can check your remaining balance or make an additional deposit at any time. Follow the steps above to enjoy the convenience and excitement of playing at a safe online casino. Click any of our links to receive some incredible welcome bonuses from some of the best casino vendors on the Internet. Our number one casino for players from United States is Raging Bull Casino – sign up and make a real money deposit to get access to exclusive new player welcome bonuses.